**Note: Joan of Acre Plantagenet is also my ancestor. Click here to go to her!!! This is great! Richard was born Abt. 1087 in Hertford, England and died on 4/15/1136 in Monmouthshire, England. He married Alice De Chester. Roger was born Abt. 1135 and died in 1173. He married Maud De St. Hillary. She died in 1195. Richard was born Abt. 1153 and died Abt. 11/28/1217. He married Amice Countess of Gloucaster. She died 1/1/1223. Gilbert was born Abt. 1180 and died on 10/25/1230. He married Isabell Marshall on 10/09/1217. She died 1/17/1238. Richard was born 8/04/1222 and died in 7/15/1262. He married Maud De Lacey on 1/25/1236. "Richard Earl of Gloucester married the Earl of Lincoln's daughter Maud, and this marriage resulted in two sons - Thomas and Gilbert "The Red", who was entitled Earl of Gloucester upon his father's death. Born in 1243, Gilbert rose to become one of the most powerful and influential men in England at his time; he used the strife of the mid thirteenth century Baronial Wars to his advantage - siding first with Simon de Montfort at the battle of Lewis in 1264, and afterwards with Henry II and Prince Edward. Indeed, the Earl of Gloucester played a crucial role in the defeat of de Montfort's army at the battle of Evesham the following year, and used the opportunity to strengthen the family's position in the Welsh borderlands." --Daniel Mersey. Richard de Clare was a leading member of the reforming party of barons in England. Gilbert was born 9/02/1243 in Hampshire, England and died in 12/07/1295 in Monmouth Castle, Gloucester,England. He was the 3rd Earl Of Glouces. He married Joan of Acre Plantagenet on 5/02/1290 in Westminster Abbey, London, England. She was born in 1272 in Acre, Palestine, Israel and died on 4/23/1307 in Clare, Suffolk, England. She is buried in Clare Priory, Suffolk, England. 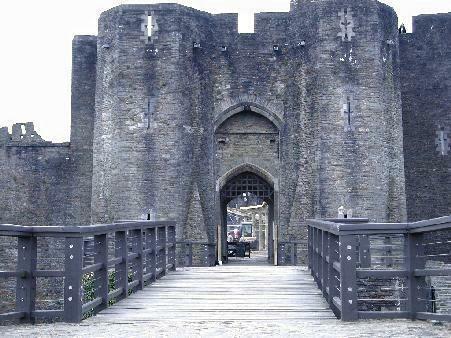 Caerphilly Castle, Caerphilly, South Wales. Photographer: Jeffrey L. Thomas. Eleonor was born in 1292 in Caerphilly Castle, Glamorgan, England and died on 6/30/1337. She married Hugh Le Despencer, Lord in 1306 in Westminster. He was born in England and died 11/24/1326 in Hereord, England. A favorite of King Edward II. His wife was co-heir of Gilbert de Clare, Earl of Gloucester. The Despencers and the Clares are both in Cokayne's "Complete Peerage." Hugh has been called Earl of Gloucester by some writers but The Complete Peerage vol.V,p715 makes it clear he was not. Executed. The Complete Peerage vol.IV.pp.267-271. **My DE CLARE line ends here with Eleonor De Clare and becomes Despencer. **Note: The information gathered here is a piece by piece collection from many sources that I have combined personally to create a more complete early De Clare Family History. If you would like to know the sources used to gain this information or have information to contribute or correct, please feel free to email me.